Bioelectronic noses can utilize olfactory receptors (ORs) as recognition elements. This chapter describes biochemical characteristics of these OR proteins. ORs being G protein-coupled receptors (GPCRs) are integral membrane proteins composed of seven transmembrane spanning helices. In mammals, there exist as many as 1,000 OR genes accounting for about 3 % of the genome. Unfortunately, no three-dimensional (3D) structure of OR is available and one must infer OR properties from those of better characterized GPCRs. The chapter offers a brief overview of the characteristics of known 3D structures of complexes of GPCRs with various types of ligands (agonists, inverse agonists, antagonists, etc.) and, in one case, also with a G protein. Based on these structural data, it then reviews hypotheses and experiments regarding the GPCR transduction mechanism. The chapter then describes how the set of known 3D structures (17 different GPCRs to date) can be used to model OR 3D structures that will be subsequently used as platform for ligand virtual screening. The following section examines the different mechanisms that regulate OR activity. 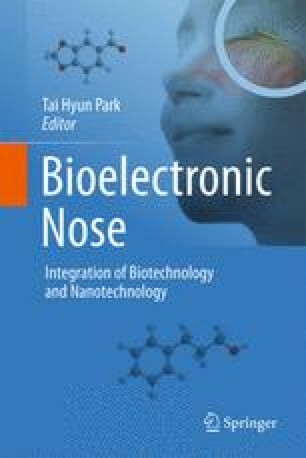 Lastly, we focus on the use of OR proteins in bioelectronic noses.